How hard is it to build your own soccer field? What types of tools are needed to create a proper soccer field? What materials will you need? In this article, we answer all of those questions and then some. Read on to learn how to make a soccer field by following the steps below. Before you begin making your soccer field, you’ll need the following tools and materials. This represents a small investment by your club but will pay big dividends in making this process as painless as possible. The exact measurements listed below are for a soccer field 60 yards by 120 yards, with an 18 yard box and 6 yard box on each end. You can use this process to make a field with any dimensions, just adjust your inputs to the formulas accordingly. 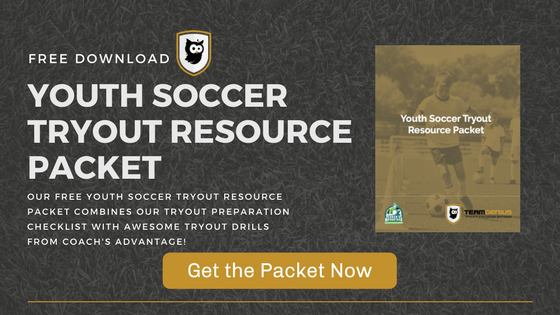 Click here for tips to running an effective youth soccer tryout. Start by locating and measuring one end line. Once you locate the two ends of the line by pulling the tape measure tight to 180′, drive a spike at each end. These spikes represent the corners on one end of the field. Also, place a spike at the center of the line at 90′. Pull the tape measure, and run a tightened string between the corner spikes. Now here’s where the math fun starts. Start a tape measure from each corner spike and one from the center spike. We are going to make a right triangle using the Pythagorean Theorem (a^2+b^2=c^2) where one side is the segment (a) from the center spike to the corner, and another segment (b) is from the corner to where the sideline meets the field center line. This ensures we get perfectly square corners. Based on the field dimensions you are trying to set up, this is essentially half the end line length and half the sideline length. In our example, our field is 60 yards by 120 yards (180’ x 360’), so our triangle sides are 90’ and 180’. To compute the hypotenuse, we get c=√(90^2+180^2)=201.25. This means that the distance from our center spike to where the sideline meets the center line is 201’ 3”. You mark this spot by running the tape from the corner out 180’ and the tape from the center spike out 201’ 3”. When the two tapes are pulled tight, put a spike where these two distances meet. Repeat this from the opposite corner to measure the center of the other sideline. Run a tape measure and a string between the two spikes placed in step 3. This is your center line. Place a new spike at the center point of this line as well. From the 3 spikes in your center line, measure out in the same direction and the same manner as in step 3. This will help you find and spike the opposite end corner spots. Run a tape measure between the two corner spikes placed in step 5. This is your opposite end line. Place a spike at the center point of this line as well. You now have your perimeter spikes set. Continue the string used to mark the first end line down the sideline, down the opposite end line, and back down the other sideline to complete the perimeter. Now we need to measure for the goal boxes. From the center spike on one end line, measure out each direction along the line half the width of the goals used for this field, and drive spikes at these spots. This represents the goal post locations. For later reference, use your spray paint to mark the location of the center spike and the two goal post spikes. Soccer fields use a 6-yard goalie box and an 18-yard goalie box. These boxes are squares when you start at the goal post for your first corner. Using the right triangle approach again, measure out from the goal post and place spikes at 18’ and 54’. Keep your soccer tryouts fair. Here are some tips for removing bias from your tryouts. Measure and spike the corner of the 6-yard box by starting a tape measure at the goal post and another at the 18’ spike, then pull out both tapes and place a spike where 18’ from the 18’ spike tape measure meets 25’5” from the goal post spike tape measure. Measure and spike the corner of the 18-yard box by starting a tape measure at the goal post and another at the 54’ spike, then pull out both tapes and place a spike where 54’ from the 54’ spike tape measure meets 59’5” from the goal post spike tape measure. Repeat steps 11 and 12 on the opposite side of the goal for the opposite corners of the two boxes. Run a tight string around the newly placed spikes to mark the two boxes. Start on the end line where the 6-yard box begins, stretch out and around the 6-yard box, and then continue along the end line to the 18-yard spike. Continue out and back around the 18-yard box spikes to complete this box. Repeat steps 11-14 on the opposite end of the field to measure and mark the boxes on that side of the field. All the straight lines are now set and ready for paint. Paint the perimeter and center lines first so those strings can be pulled up first. Paint the center circle by putting a tape measure at the center point of the center line, measure out 30’ and have a helper hold the tape tight at that point. Follow this point with the painter as the helper walks around in a circle. Continue walking and painting until the circle is complete. Paint the goal boxes accordingly, then pick up the string when completed. For the Penalty Kick (PK) spot, start a tape measure at the center of the goal on the goal line and measure straight out 36’ and place a spike. You can use the painter to mark a hash at this spot. Now place the start of the tape measure on this PK spot spike and measure out to where 30’ meets the top line of the 18-yard goal box. Using the helper again, hold the tape at 30’ and follow with the painter in an arc around the outside of the box and stop where 30’ meets the goal box line again. This creates the arc at the top of the box. Repeat step 19 on the other end of the field. You can now assemble and place your goals in nets, aligning the posts with the painted hash marks created earlier. Be sure to anchor the goal to meet safety requirements. Your field is now ready for use. We know this seems like a long process, but once you do it a few times, and with a good number of helpers, a full sized field can be created from scratch in about 1.5 hours. Good luck!